Mody (Woodrow Wilson School, Princeton Univ.) has written a page-turning work that combines deep political and economic analysis with fluent prose... This book provides an excellent historical thread for understanding the current crisis in the EU, and specifically in the eurozone....Summing Up: Highly Recommended. A comprehensive and authoritative history of the euro which argues that the project was a predictable error. Comprehensive and fastidiously researched... One of the many strengths of Mody's book is its detailed historical narrative of how the tragedy unfolded... Whether or not one agrees with Mody's policy prescription for an ultimate happy ending, this is a supremely authoritative telling of the sad tale. The sweeping chronology of the euro is well told... he has such a good eye for what is economically important that his observations trump much of the conventional analysis he echoes... The most original parts of his book are the reasoned explanations of why debt restructuring of both sovereigns and banks should have been embraced early in the crisis and should be made a regular tool in future crises. Another highlight is his debunking of the 'Deauville myth'... Ifonly this lesson is taken away, the book will have rendered a public service. 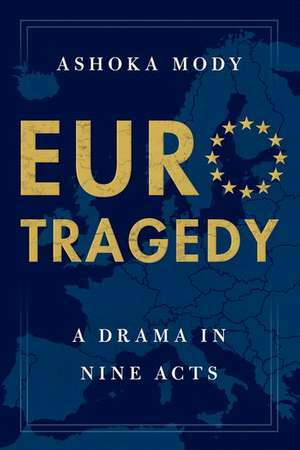 Mody's tome (and it is a real door-stopper) comes from a uniquely valuable perspective [EuroTragedy] is the most detailed account yet of how the EU got things so badly wrong, and why. Combining both narrative history and detailed charts and tables, Mody's book will appeal to scholarly readers, while still being straightforward enough to be enjoyed by the intelligent layperson... it is currently one of the leading works on the subject and one of the few that conveys some of the passion and urgency surrounding the issue. EuroTragedy: A Drama in Nine Acts presents the gloomy case particularly well. The many errors in official Europe's attempts to deal with the euro-area crisis are richly documented in Ashoka Mody's new book, EuroTragedy. His thoroughly researched story is lively and full of detail, especially highlighting unwise and incoherent policy statements made by politicians and others in countries on both sides of the great euro-area divide between creditor and debtor. There is indeed much to criticize, and the economist has skillfully woventogether many of the diverse strands of the euro-area crisis, as well as the fateful decisions taken during the years of its planning and construction. In this book, the best history of the recent eurozone crisis yet to appear, Mody argues that the euro is dysfunctional because it defies the principles of economics... Mody recounts this history in admirable detail. [C]onvincing, readable, and satisfactorily acid. If you want to really, really understand how the Eurozone came to be and how it went awry, this is the book for you. A page-turning work that combines deep polítical and economic analysis with fluent prose ... This book provides an excellent historical thread for understanding the current crisis in the EU, and specifically in the eurozone. Mody's book is one of the most coherent histories of the euro, starting at its origins in the minds of European leaders like Georges Pompidou and ending with the crisis that began in 2010. But perhaps the most important contribution Mody makes is his critique of the 'pro-European' ideology that was used to justify the euro's creation. A magisterial overview of Europe's remarkable single currency experiment. Written in a style accessible to a wide readership, it is a must-read for researchers and policymakers. This brilliant new book would also be perfect as a main text for a university course on the euro and European integration. One does not have to share Ashoka Mody's view that the German government should admit guilt for the Euro crisis to recognize that this book is fascinating reading, full of insight into the history of the euro and its ultimate failure. Written by a leading scholar and former senior IMF official, there is much to be learnt from this extremely well-written and important work. We need books like this to enter a frank and open debate. Mody develops a dramatic historical narrative of how European leaders brushed aside the warnings of many economists and went ahead with the euro, not knowing where this would lead them. Instead of creating unity, the euro has contributed to Euroscepticism and intensified division in Europe. Mody identifies the reason: the Eurozone is an incomplete monetary union that leads to divergence and instability. This contrarian' book will not be popular in Brussels, but allthe more so elsewhere. Ashoka Mody is Charles and Marie Robertson Visiting Professor in International Economic Policy at the Woodrow Wilson School, Princeton University. Previously, he was Deputy Director in the International Monetary Fund's Research and European Departments. He has also worked at the World Bank, University of Pennsylvania, and AT&T's Bell Laboratories. Mody has advised governments worldwide on developmental and financial projects and policies, whilewriting extensively for policy and scholarly audiences.